I purchased a new Ultegra R8070 Di2 Hydraulic road bike groupset from a major online bike shop. Very happy with the price, delivery, etc however I have become a bit concerned that the caliper fixing pin (Y8N207000) was not included for either flat mount mount caliper, which I assume is a required safety critical component. 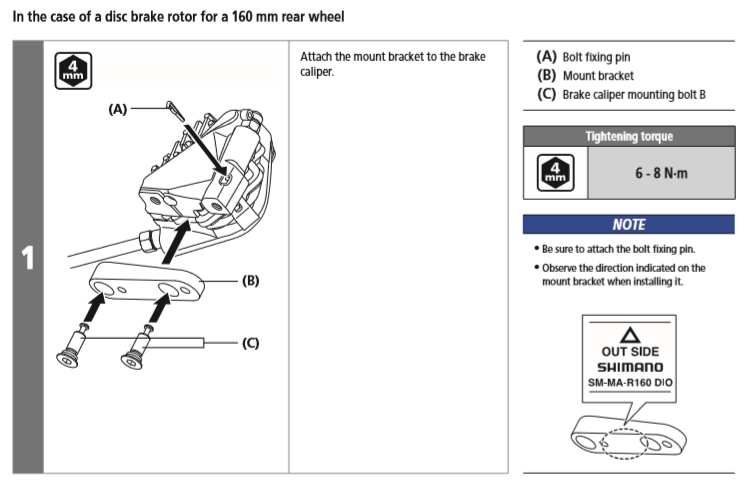 The picture below shows it in the dealers manual on page 100-108 (https://si.shimano.com/pdfs/dm/DM-R8050-01-ENG.pdf). 1. Has anyone ordered and installed a new shimano flatmount road disc brake groupset and did you receive the fixing pins and install it? 2. Am I being silly and this pin isn't required and it shouldn't neccesarily be provided? 3. Should this bike shop know better and should I recommend for them to contact all previous customers of groupsets and bikes that they should check if they have these pins and make sure they install them? If Shimano didn't think it was necessary they wouldn't engineer the screws to work w/ them. They're on every flat mount brake I've ever seen. Every Shimano disc road bike on our floor has them. 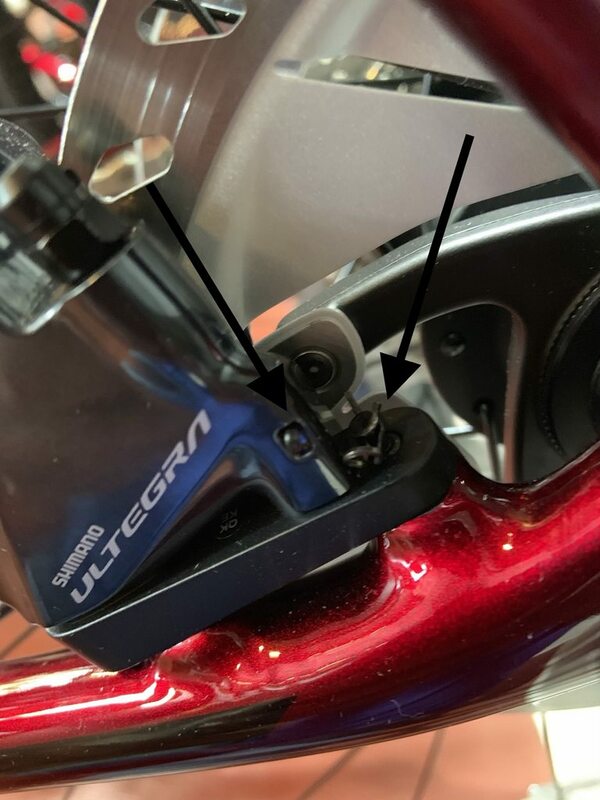 There are 2 different safety pins, the one you have seen in the diagram posted and another that clips around the flat mount adapter for the rear brake. The front brake has the single clip (basically it's an old V-brake pad clip). Thanks. Makes sense to me as well. Unfortunately I’ve come to the end of my email conversation with them as it’s going nowhere. It’s pretty apparent that they are annoyed with me and are sticking to their response. I was going to push the fact that I’m disappointed that they haven’t provided everything I’ve paid for and should have received, they need some Shimano training, and they should do a recall of some sorts to send everyone out pins that they haven’t received or that wasn’t installed on their bike. I’m sure Shimano would be the ones that get the bad rep if people’s calipers start falling off with no safety backup. I’m definitely getting some pins and putting them in. But I don’t have time to keep on discussing it with them and my frustration will start showing through, which I have tried to remain diplomatic so far. The stock that I have checked and do not come with these, I have checked with our workshop manager, who has fitted hundreds of these, and he has said that they are not required as long as the bolts are tightened up correctly. I’m sure Shimano would be the ones that get the bad rep if people’s calipers start falling off with no safety backup. I’m definitely getting some pins and putting them in. But I don’t have time to keep on discussing it with them and my frustration will start showing through, which I have tried to remain diplomatic so far. Contact Shimano and let them know. Yeah, that might be the best way forward; send Shimano the email chain. Then because they are a UK bike shop giant then hopefully Shimano will follow up with them and hopefully their past customers should ideally get contacted to have their brakes checked. Forward them the photo I posted. I will thanks. It's a good shot and I liked your comment about why would they engineer it if it wasn't needed. Especially for a bolt thats upside down and is just asking to fall out, where the little pin will stop it unthreading to start with. I had already sent them the below two youtube's showing that they should have come in the box. I'm a bit dumbfounded with them to be honest. Question about shimano chains and connection pins! Help me please!